Go team go! And pass me another burger and beer! 1. Get the mini bags of Fritos and have everyone build their own "taco" to their liking. Here's the recipe. It works well if you don't want to cook too much, because all you have to do is prep chili and chop some toppings! 2. Serve boozy lemonade in plastic bags with straws to make it easy to distribute drinks evenly. Plus, you can freeze them overnight and stick 'em in your cooler the morning. That way, they can help keep everything else cold. Here's the tutorial. 3. Or try using tequila to spike a pouch of Capri Sun. It's like childhood but better, trust me. Here's how to do it. 4. Rock your team spirit from the top of your head to the tips of your ...burger buns? Learn how here; don't worry, it's done with affordable food dye spray. 5. Keep everything sanitary, especially in a big group, by serving dip in individual plastic cups. Get the how-to for these mini bowls of seven-layer dip here. 6. Tote condiments in an empty cardboard six-pack. And if you're more a strictly-ketchup-and-mustard crew, you can use the other slots to hold forks, knives, spoons, and napkins. From here. 7. Freeze water bottles to use as ice packs in your cooler. Then after they melt, you can drink them! From here. 8. 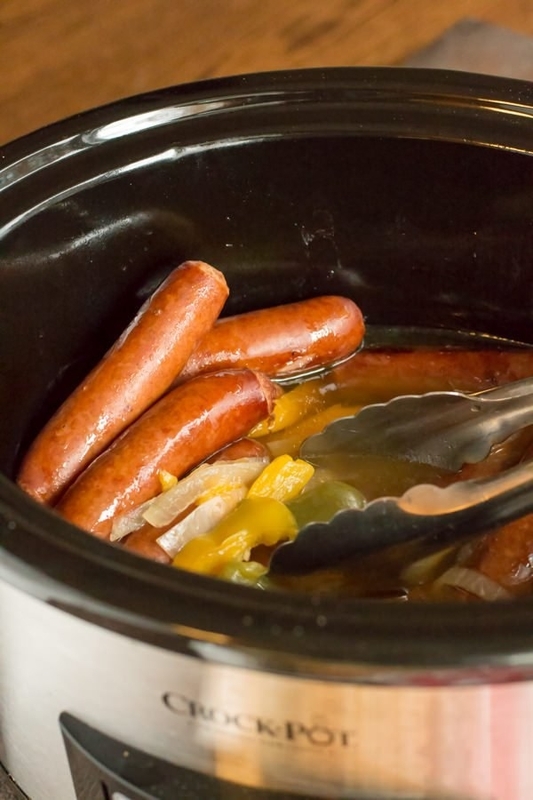 Make hot dogs or beer brats for a crowd in a slow cooker. 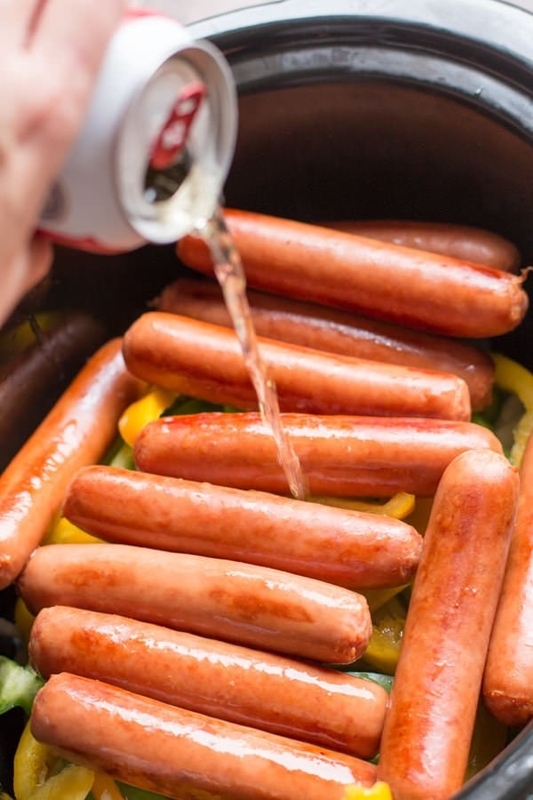 Get the recipe for these Easy Beer Brats with Peppers and Onions here. 9. Then check out these creative toppings to make a delicious DIY hot dog bar. 10. Use this color guide to make frosting in the exact shades of your team's colors. 11. Serve your Jell-O shots in oranges instead of in normal Jell-O shot containers so you can easily dispose of the peels. Cuter and more eco-friendly than dozens of small plastic cups. You can just make your basic jello shot recipe, or use this fancy one. Find other ideas for a football feast here. 12. Place a decorative cupcake wrapper in a mason jar lid to keep the flies out. It can also help minimize spills with the kiddos, although it won't fit as tightly as a real lid would. Learn more here. 13. Pack salads or fruit in plastic drink cups, and stick a fork in the hole for the straw. When you pull the fork out, you'll have to clean off the handle, but that's a small price to pay for convenience. Get the recipe and instructions here. 14. Make jalapeño poppers even easier (and even cheesier) by turning them into a creamy dip. The classic bacon-wrapped bites are obviously a tailgate classic, but sometimes you just don't have time to cut up a thousand peppers, stuff them with cheese, and wrap them in bacon. For those days, there's this dip. 15. Make breakfast tacos the night before, wrap them in foil, and reheat them on the grill in the morning. Perfect for brunch or early morning tailgates. Get the recipe here. 16. Fill an old laundry soap dispenser with water to make an easy hand-washing station. Eating all that food can get messy! A detergent dispenser like this one works really well. From here. 17. Then stuff the back of your truck (or car!) with a bunch of pillows so you can curl up and nap / watch the game when you're done eating and cooking. So cozy and delicious! (Yes, this is a fancy Pinterest picnic and not a tailgate, but you still could stuff your truck bed with pillows and blankets in your team colors).